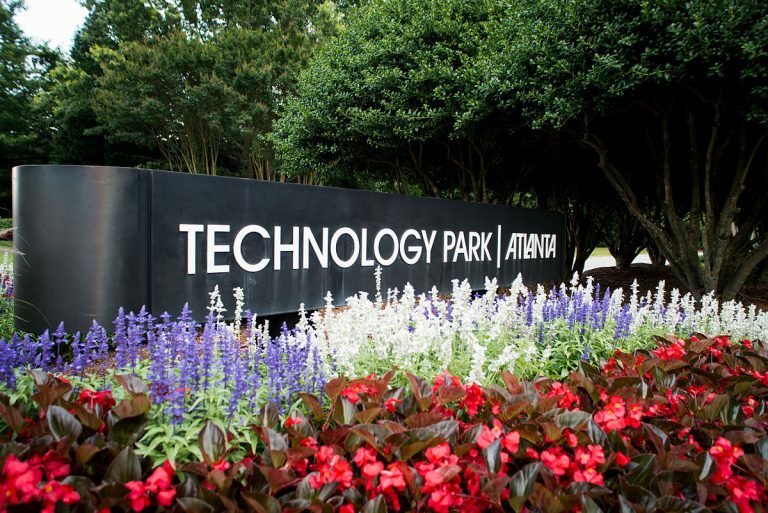 Part 3 in our series on the Energy Petal in the Living Building at Georgia Tech. Read the first article here. One of first decisions to affect the energy demand of any building is its siting. And an early siting choice on the Living Building at Georgia Tech makes the task of achieving net positive energy performance a bit more demanding than usual. In the Spring of 2016 — soon after the team led by Lord Aeck Sargent and The Miller Hull Partnership won the competition to design the building — Georgia Tech asked the architects to refine one of two schemes the team had presented. That plan included several passive solar energy-saving features. An exposed thermal mass of concrete flooring would retain energy and then gradually release it to moderate indoor hot and cold temperatures. Mature trees to the northwest and eventually newer trees to the west would shade the building and cut the cooling load. A generous serving of triple-pane windows would provide natural light while limiting solar heat gain. And a wide overhang all the way around the roof would shade windows and walls from those Southern summer solar beatdowns. Another of the building’s attributes presented a thornier issue. 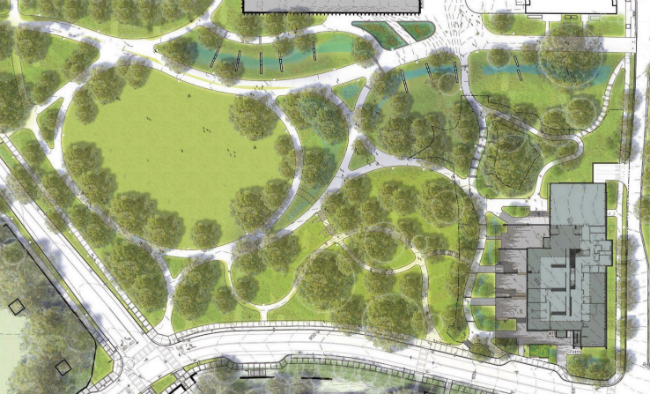 The architects had determined that it must sit in the southeast corner of a 20-acre tract set aside for the Eco-Commons, the campus’ signature regenerative landscape project. That corner is the closest part of the tract to the center of campus. 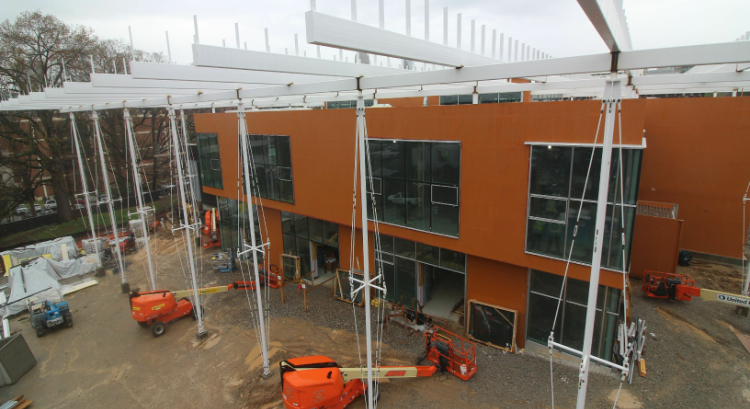 So placing the structure there makes it easier for most students to reach the building by foot. 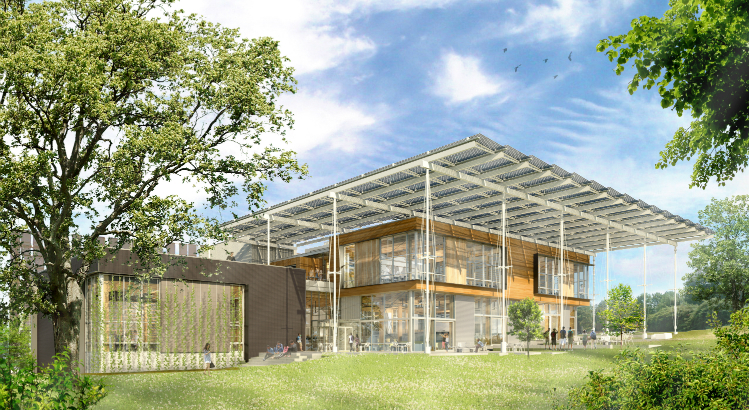 Both the design team and Georgia Tech believe a large porch will help connect the Living Building to the Eco-commons just to the west. Image by Andropogon. The complication arises from the building’s orientation at that location: Its long dimension runs north-south, which opens lovely views from the building to the west — across the full breadth of the Eco-Commons. LAS and Miller Hull called that approach the “porch scheme” because it features an enormous porch along the west facade, with essentially a two-story glass wall behind it. That’s great from a biophilic perspective. From an energy perspective, however, the porch scheme presents challenges. Orienting the long dimension of a building on a north-south axis invites more solar heat inside — especially when those long east and west walls have lots of windows. A porch can be a cooling feature, which is one reason its a favorite in traditional Southern architecture. But a porch isn’t as effective at cooling a building when placed along the west facade. On that side of the building, it does little to block harsh, late afternoon rays. Early on glass slats were considered for the porch shading. After modeling, that option was rejected. Image by PAE. Brune, an associate principal at PAE in Portland, Oregon, is leading the mechanical, electrical and plumbing engineering of the building. He and his colleagues were given the task of figuring out how to reduce the heat gain invited in by the building’s long, glass-heavy western facade. Had the Living Building at Georgia Tech been a conventional high-performance project, that heat gain would have been considered marginal. Increasing the capacity of the air conditioning easily could have addressed the slightly higher demand for cooling. But Living Building Challenge 3.1 requires projects to use less energy than they produce. And because adding solar panels usually is more expensive than reducing the amount of energy needed to operate, the team was trying to keep energy demand as low as possible — under 30 by the standard measure of energy use intensity. 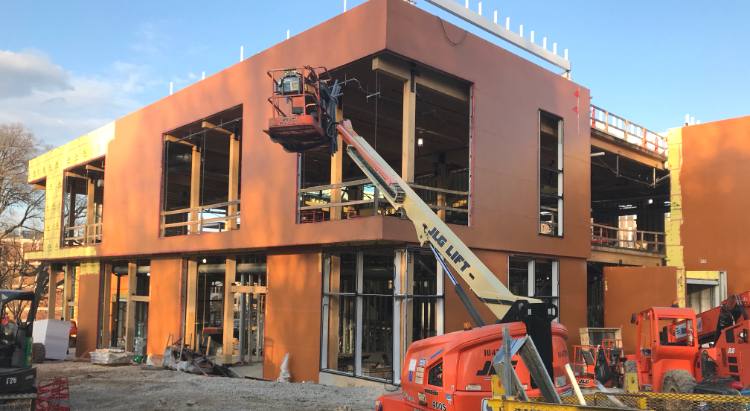 It was time to get into the nitty-gritty of modeling the impact that various windows and shades would have on both the building’s daylighting and heat load. PAE used a state-of-the-art program called Integrated Environmental Solutions VE to model every prospective change in the building. First, the engineers worked with the architects to analyze the glass along the porch side of the building. But there was a limit to how far they were willing to go with that. Natural light and the connection that views could offer between the building and the landscape were important. West elevation shows operable Venetian blinds the team settled to reduce solar heat through first floor windows. This image and rendering at top of article provided by Miller Hull and Lord Aeck Sargent. 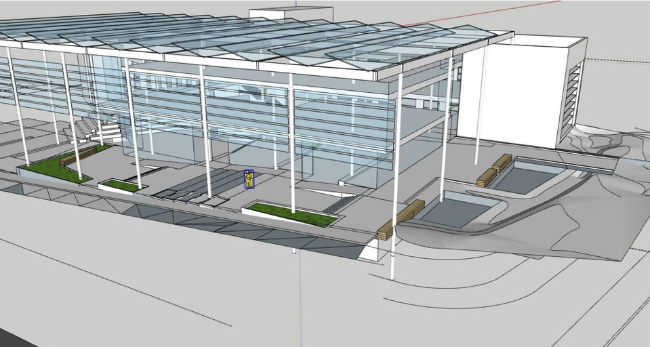 Working back and forth between daylighting studies performed by Lord Aeck Sargent and the IES-VE modeling performed by PAE, the team searched for the right shading solution. Heat gain and daylighting weren’t the only considerations. Some options might alter the airflow, which would in turn change the way the occupants felt at certain temperatures. The plan already called for triple-pane windows. But the design team rejected electrochromic, “smart” glass, which darkens when hit directly by sunlight. 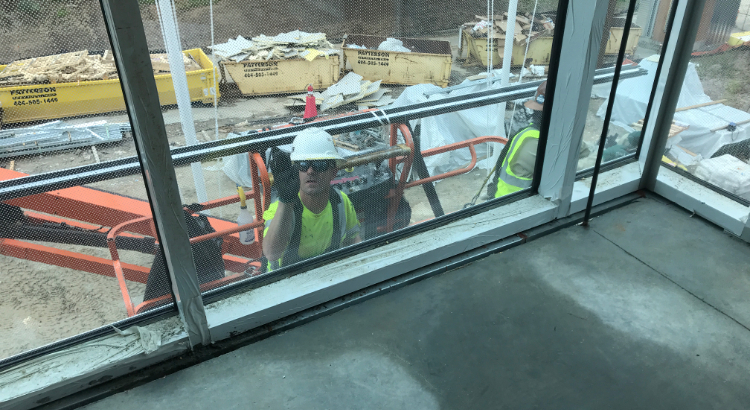 Much like shrinking the windows, that would have affected both the quality of daylight and the visual connection from outside in. It’s also mighty expensive. A layer of slats placed horizontally between the first and second floors of the porch presented maintenance issues, and it also would alter the open feel of the porch. Similar drawbacks nixed a stainless-steel mesh that would have been placed along the front of the porch. The team finally settled on relatively modest choice: Horizontal, operable Venetian blinds placed on the outside of the building’s east and west windows were cost-effective, and their flexibility will allow applicants to balance the sometimes conflicting interests of cooling the building and providing natural light. That modesty of that approach seemed to make more sense when, for cost reasons, the team had to remove the blinds from the second floor behind the porch. Overall, the design that they settled upon contains many classic energy-saving features. At the same time, it took a bow toward hard realities: Sometimes — most of the time — a site doesn’t cooperate with all the principles perfect passive solar design. And very seldom do budgets allow for the most extravagant solutions. Now, the question for Brune and the rest of the design team was whether they’d taken enough steps to reduce energy demand. Had they cut the cooling load sufficiently to meet the building’s heating, ventilation and air conditioning while still keep the building net energy positive? Coming soon: An efficient cooling system for a Southern building.